The Burghley octagonal Summerhouse is a larger version of the Baltimore Summerhouse and similarly includes a pair of glazed lockable doors and casement style windows. The doors and windows can be hooked open during a warm day and can be closed to provide the ideal garden hideaway when the temperature gets cooler. 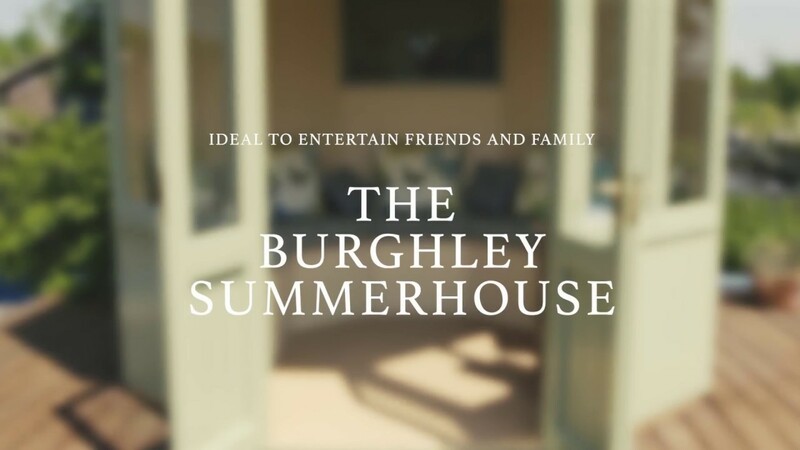 The Burghley octagonal summerhouse is increasingly popular for outdoor entertaining. Available in three sizes 2.4m, 3m, and 3.6m width. The 2.4m Burghley Summerhouse – 2.44m in diameter plus 120mm roof overhang. 2.0m to eaves height and 3.0m to the top of the roof. The 3m Burghley Summerhouse – 3m in diameter plus 120mm overhang. 2.0m to eaves height and 3.0m to the top of the roof. The 3.6m Burghley Summerhouse – 3.6m in diameter plus 120mm overhang. 2.0m to eaves height and 3.5m to the top of the roof. A pair of lockable doors is available to the front section of the summerhouse. The doors and windows can have brass or chrome ironmongery and are fitted with 6.4mm laminated glass. The doors come complete with a rebated mortice lock. Brass cabin hooks are fitted to secure the doors when open. The 2.4m Burghley is supplied, as standard, with a one piece lead effect glass fibre moulded roof which has a long life expectancy. One can easily encourage fungi to grow on the roof to make it more ‘natural’ looking. Alternatively, for a more natural effect a cedar shingle roof can be supplied. The cedar shingle roof comes complete with a copper finial and requires minimal maintenance. The 3m and 3.6m Burghley summerhouses are only available with a cedar shingle roof.